The Du Noon Local Football Association (DLFA) is furious at the prospect of losing the only available football field in the township as residents are turning it into a dumping site.Despite a city sign next to the field declaring ‘Du Noon sports field, this city works for you”, the field is not taken care of. The ground is uneven, large patches have no grass and in places irrigation water pipes under the ground are visible on the surface. Also, due to dumping occurring around the field, soccer players have to endure the foul stench of rotting refuse. But the appalling condition of the field does not deter soccer obsessed residents from practicing on the field. Every weekend, soccer matches attract over 300 spectators, according to DLFA spokesperson Zolisile Seku. Seku said the DLFA is affiliated to the SA Football Association (SAFA) has five junior teams and 17 senior teams playing in the super league. On every weekend, he said, all the teams practiced on the dilapidated sports field, and they had to divide the sports field into sections and play across its width rather than its length. “The pitch is in dilapidated state but we play for the love of the game,” said Seku. He said for anything to be done about the pitch it seemed people had to have a demonstration and the soccer players were planning to march to make their plight known. 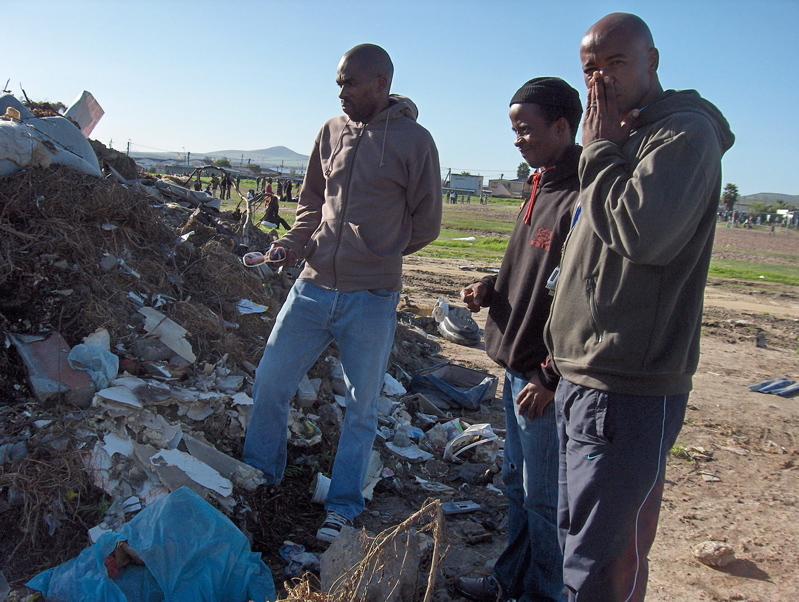 He blamed the general public in the township for dumping rubble and dead animals next to sports field despite the fact that it was the only field available for their own children to play on. “Mostly it’s the general public dumping on the sports field. These people (the residents) don’t understand why we are here on the pitch. We are trying to keep their kids from the street and help them to be responsible citizens,” he said. DLFA assistant treasure, Skhumzi Ntsendwane, said there was also no field for the Du Noon women soccer team and the DLFA had to hire a taxi for the women’s team to play and practice on a field outside of the township. Former Blaauwberg sub-council chair Heather Brenner who is currently the DA nominee to take up her old position following the recent municipal election, said there was R200,000.00 made available for the Du Noon sports field in the city’s budget 2011/2012 budget. Asked why the Du Noon sports field had been left to dilapidate, Brenner said every ward councilor was allocated a R300 000 capital budget and R200 000 operational budget and that when the city was preparing its budget, ward councillors and ward forums were asked for a list of things they would like attended to. “There has been R200 000 put aside on the capital allocation for that ward’s upgrading of the Du Noon sports field,” said Brenner. ANC ward councilor Lubabalo Makeleni agreed that the field was dilapidated and needed to be revamped, and confirmed that R200 000 had been made available from his ward capital budget allocation to fix it. But he said he needed to consult the Du Noon sports community to decide how best to go about fixing the field. He said there was also another football field situated behind the Inkwenkwezi Secondary School which the city had revamped in March. But Seku said the gates to that football field were always locked as such they could not make use of it. So typical – the response from Heather Brenner and Lubabalo Makeleni! Passing the buck and making excuses is what they are really good at – not service delivery! Give the keys to the DFA – from one hand to another – ceremonies are a waste of money and time! I am sure that not even half of the R200K will be spend on the field – it will be lining someone’s pocket!